De vuelta en Madrid con una cansina gripe veraniega tras una temporada de vacaciones en Almería visitando a BB, el único amigo cuyo número de teléfono conservo de aquella mítica época en que íbamos a la playa del Sardinero en manada mientras nos nacía vello corporal en zonas insospechadas. Por lo demás, todo estupendo: playa, fiesta, tapeo, playa, gol de Iniesta. Vagancia absoluta. La vagancia es lo mío. En una de las fiestas conocí a un muchacho oriundo y tuvimos una conversación que ya he tenido mil veces… Me preguntan de qué trabajo, contesto que enseño a la gente a escribir ficción y me responden que eso es imposible. Que no se puede. Lamentablemente, la fiesta era un cumpleaños y había barra libre, así que opté por una opción abierta y dije algo como: ¿Me estás diciendo que mi trabajo no sirve para nada y que engaño a la gente? Al final no me peleé con nadie, pero discutí mucho y no expliqué nada. Así que, en deuda con BB por soportar mi mal comportamiento y ahora que quiere ponerse a contar historias (con el agravante de que fue él quien me contagió la afición invitándome a un ciclo de Orson Welles en Tantín ¿te acuerdas?) he pensado ver en los próximos días una de las teorías narrativas más extendidas. 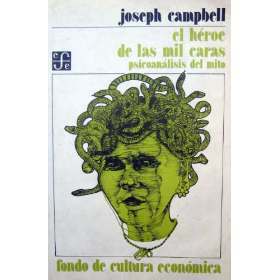 El Monomito (término que tomó prestado de James Joyce) o Viaje del Héroe, es una teoría narrativa que expuso Joseph Campbell en El héroe de las mil caras, libro de obligada lectura en todo programa oficial de narrativa que conozco. Básicamente, el tipo se dedicó a estudiar cuentos de hadas, leyendas artúricas, ritos iniciáticos, relatos bíblicos, mitos y tragedias griegas, nórdicas, orientales… narraciones de distintas épocas y culturas de todo el mundo y encontró un patrón básico. Diecisiete etapas por las que pasa todo mito que se precie. Observó, además, que muchos de los elementos de estas etapas presentaban claros y significativos paralelismos con el simbolismo de los sueños. Pensó entonces en la posibilidad de que estos sistemas simbólicos comunes se debían a creaciones naturales de la mente humana, así que topó con los postulados del psicoanálisis de C.G. Jung (el inconsciente colectivo, los arquetipos…) para justificar las coincidencias en relatos mitológicos de toda época y lugar, y para explicar la función dramática y psicológica de cada una de las etapas en relación con los personajes. Esta entrada fue escrita el Domingo, 25/Jul/2010 y archivada en General. Puedes seguir las respuestas en esta entrada a través de RSS 2.0. Tanto los comentarios como los pings están actualmente cerrados. ¡Puf, qué susto!, pensaba como K que la despedida era porque acababa el blog. Bienvenido después de las vacaciones, y cuidado con la gripe veraniega, que en esta época las gripes son de lo mas engorroso de quitar. El señor de los anillos! Si tanta alusión pretendía comprobar que sigo lo que haces y leo lo que escribes, aclarado queda. Ah, la semana que viene tenemos ciclo de Truffaut antes de volverme a Almería. Hasta entonces, un abrazo (los abrazos son lo mío, qué le vamos a hacer). I would like to express my appreciation to you just for rescuing me from this issue. Right after looking out throughout the internet and coming across advice which are not pleasant, I thought my entire life was gone. Living minus the answers to the issues you’ve resolved by means of your entire review is a crucial case, and those that could have in a negative way damaged my entire career if I had not come across your site. Your own personal knowledge and kindness in controlling every item was very helpful. I am not sure what I would’ve done if I hadn’t discovered such a step like this. I can also now relish my future. Thanks a lot very much for the reliable and result oriented help. I won’t be reluctant to recommend the website to anybody who would need recommendations about this matter. Spot on with this write-up, I really think this web site wants way more consideration. I抣l most likely be again to learn far more, thanks for that info. I抦 impressed, I need to say. Actually not often do I encounter a blog that抯 both educative and entertaining, and let me tell you, you’ve hit the nail on the head. Your idea is excellent; the difficulty is one thing that not enough persons are speaking intelligently about. I’m very joyful that I stumbled across this in my search for something relating to this. Thanks for all your work on this web page. My mother really loves working on research and it’s easy to see why. A number of us learn all regarding the lively method you produce powerful techniques on your web site and therefore increase response from other people on the subject matter then our daughter is in fact discovering a lot. Enjoy the rest of the year. You’re the one carrying out a really great job. Good post. I learn something more challenging on completely different blogs everyday. It should all the time be stimulating to read content material from different writers and apply a bit of something from their store. I抎 want to use some with the content on my blog whether or not you don抰 mind. Natually I抣l provide you with a hyperlink in your net blog. Thanks for sharing. I was very happy to seek out this net-site.I needed to thanks on your time for this wonderful learn!! I definitely enjoying every little bit of it and I have you bookmarked to check out new stuff you weblog post. I wanted to compose you this bit of note to finally give thanks yet again just for the fantastic strategies you have featured above. It has been really remarkably open-handed of people like you to provide unreservedly precisely what many people could possibly have offered for sale for an e book to help make some profit on their own, primarily considering the fact that you might have done it in case you considered necessary. These secrets additionally acted like the easy way to realize that the rest have similar desire just like my very own to figure out a little more when considering this condition. I believe there are some more enjoyable instances up front for those who read through your website. I used to be more than happy to search out this internet-site.I wished to thanks on your time for this excellent learn!! I positively enjoying every little little bit of it and I have you bookmarked to take a look at new stuff you blog post. Spot on with this write-up, I really think this website needs rather more consideration. I抣l probably be again to read way more, thanks for that info. I want to express appreciation to this writer just for rescuing me from this type of challenge. Just after browsing throughout the the net and obtaining recommendations which were not helpful, I figured my entire life was over. Living devoid of the strategies to the issues you have solved by way of your article is a critical case, and the ones that could have in a wrong way affected my entire career if I had not come across your web page. That training and kindness in touching everything was priceless. I am not sure what I would have done if I had not come across such a stuff like this. I can at this moment look forward to my future. Thanks a lot very much for this impressive and sensible guide. I won’t be reluctant to suggest the sites to anybody who will need guide about this topic. Nice post. I be taught one thing more difficult on totally different blogs everyday. It is going to at all times be stimulating to read content material from different writers and practice a bit something from their store. I抎 want to make use of some with the content on my weblog whether or not you don抰 mind. Natually I抣l provide you with a link in your web blog. Thanks for sharing. This website online is really a walk-via for all the info you wanted about this and didn抰 know who to ask. Glimpse here, and you抣l undoubtedly discover it. This web page is really a walk-through for all of the information you wished about this and didn抰 know who to ask. Glimpse here, and you抣l definitely uncover it. There are actually a variety of particulars like that to take into consideration. That is a great level to carry up. I provide the thoughts above as normal inspiration however clearly there are questions like the one you convey up the place the most important thing will probably be working in sincere good faith. I don?t know if greatest practices have emerged around things like that, however I am positive that your job is clearly identified as a fair game. Both girls and boys feel the influence of only a moment抯 pleasure, for the remainder of their lives. you could have an incredible blog right here! would you prefer to make some invite posts on my weblog? My wife and i ended up being satisfied that John managed to deal with his survey by way of the precious recommendations he acquired from your very own blog. It is now and again perplexing just to always be giving freely guidance which some other people may have been trying to sell. We really discover we now have the writer to give thanks to because of that. The specific illustrations you made, the simple blog menu, the relationships your site aid to engender – it’s all astonishing, and it’s assisting our son in addition to the family feel that the issue is pleasurable, and that’s seriously essential. Thank you for all! A lot of thanks for all your hard work on this website. Kate takes pleasure in carrying out internet research and it’s easy to see why. A number of us hear all regarding the lively medium you create advantageous items by means of the blog and therefore cause participation from some others about this situation and my daughter is certainly becoming educated a whole lot. Enjoy the remaining portion of the new year. You have been doing a good job. There are definitely lots of details like that to take into consideration. That could be a great point to convey up. I supply the ideas above as basic inspiration however clearly there are questions just like the one you carry up where a very powerful thing can be working in sincere good faith. I don?t know if finest practices have emerged around things like that, however I am certain that your job is clearly identified as a fair game. Both boys and girls really feel the impact of only a second抯 pleasure, for the rest of their lives. Aw, this was a very nice post. In idea I wish to put in writing like this additionally ?taking time and actual effort to make an excellent article?but what can I say?I procrastinate alot and under no circumstances seem to get one thing done. I just wanted to make a small note to appreciate you for those awesome strategies you are showing here. My extended internet investigation has finally been compensated with high-quality content to go over with my best friends. I ‘d repeat that most of us visitors actually are rather fortunate to exist in a really good site with so many awesome individuals with insightful things. I feel truly blessed to have seen your entire website page and look forward to plenty of more brilliant minutes reading here. Thank you again for everything. Good day! I simply would like to give a huge thumbs up for the great info you may have right here on this post. I will be coming again to your blog for extra soon. I was more than happy to find this internet-site.I needed to thanks in your time for this glorious learn!! I definitely having fun with each little little bit of it and I’ve you bookmarked to take a look at new stuff you weblog post. Aw, this was a really nice post. In concept I would like to put in writing like this moreover ?taking time and precise effort to make a very good article?however what can I say?I procrastinate alot and by no means seem to get something done.